Is your kid’s birthday approaching soon? You have made all the arrangements. The catering, decorations and all other things under the sun are taken care of but something might be missing. Have you contacted any professional kid’s entertainer? If you are in Melbourne, you are in luck as there is no dearth of professional Kid’s entertainers Melbourne. Baloonatic Bruce is a pioneer among them. Balloonatic Bruce has a unique and great talent in the art of balloon twisting and is a proficient balloon magician. Balloonatic Bruce has an exceptional level professionalism in both attitude and conduct. He can both entertain and amaze, and enthrall kids and adults alike. 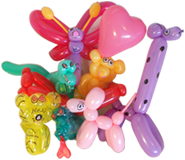 So, if you are looking for a professional Kid’s entertainers Melbourne, look no more and contact Balloonatic Bruce for great fun and memorable experience.